CHARLESTON, West Virginia, January 10, 2014 (ENS) – Last night, a chemical spill on the Elk River, two miles above the Elk River water treatment plant near Charleston, contaminated drinking water for more than 100,000 households in eastern West Virginia. 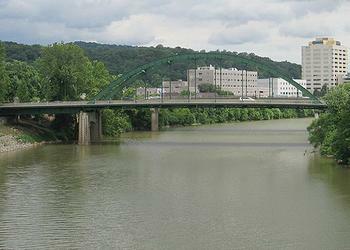 The spill, which occurred at a Freedom Industries storage facility 1.5 miles upstream from West Virginia American’s water intake along the Elk River in Charleston. The spill involved a 48,000 gallon tank of a chemical used to treat coal before it is sent off to be burned at coal-fired power plants. The chemical, called 4-methylcyclohexene methanol, may impact the health and safety of local residents with symptoms such as vomiting, skin blistering and burns in the throat. Residents in nine counties have been advised not to use the water for any purpose other than flushing. The water provider, West Virginia American Water, has issued a DO NOT USE WATER NOTICE for all West Virginia American Water customers in Kanawha, Boone, Putnam, Lincoln, Logan, Clay, Roane and Jackson counties, as well as customers in Culloden in Cabell County due to the chemical spill. “Due to the nature of the contamination, as a precaution, customers should not use their water for any purpose. Bottled or alternative sources of water should be used for drinking, making ice, brushing teeth, washing dishes, bathing, food preparation, baby formula and all other purposes until further notice. Water quality specialists continue to monitor water, and crews will conduct flushing throughout the distribution system,” the water utility warned. West Virginia Governor Earl Ray Tomblin said today that he dispatched the state Department of Environmental Protection to Freedom Industries on Thursday, ordering it to halt further leaching of the chemical into the river. President Barack Obama this morning authorized federal emergency aid to West Virginia to supplement state and local response to the chemical spill. The Federal Emergency Management Agency said the move authorizes FEMA to coordinate all disaster relief efforts following the spill of the coal-cleaning chemical from Freedom Industries. Emergency protective measures, limited to direct federal assistance, will be provided at 75 percent funding. Eminent domain is the legal authority for a governmental entity, or a private entity authorized by the government, to take private property for public use. 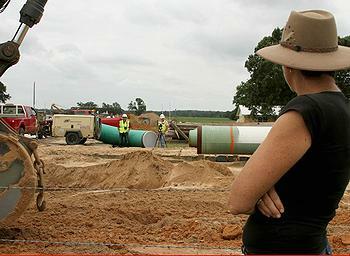 The Texas Supreme Court Tuesday ruled in favor of Texas landowner Julia Trigg Crawford, ordering the Canadian pipeline giant to submit information by February 6 as the justices weigh arguments in the case regarding abuse of eminent domain by the company on her property. At the heart of Crawford’s case is the ability of TransCanada, a foreign corporation based in Calgary, Alberta, to use eminent domain under the state’s “common carrier” clause since their pipeline transports 90 percent Canadian tar sands diluted bitumen and 10 percent North Dakota oil. Attorneys for the Crawford Family Farm Partnership argue that because there is no on-ramp for Texas oil, the pipeline does not meet the definition of a common carrier under Texas law. Crawford says her case has broad implications, because if she wins, TransCanada and other foreign oil companies will no longer be able to use eminent domain to seize land for their private profit without direct proof their pipeline is carrying Texas oil. Starting in August 2012, TransCanada has built the southern leg of the Keystone XL pipeline, a 485-mile, 36″ export pipeline that will pump 700,000 barrels of tar sands bitumen per day to refineries along the Gulf of Mexico. When landowners such as Crawford have been unwilling to sell TransCanada their land, the company has used eminent domain to seize properties along the pipeline route. Crawford hopes the courts will decide that these property seizures were illegal. She looks forward to her family’s day in court. The ruling means that Crawford will be able to take the next step in the appeals process against TransCanada. The southern segment, also known as Gulf Coast Segment, stretches from Cushing, Oklahoma to Beaumont, Texas. The northern segment, which would extend from Hardisty, Alberta to Cushing, needs a Presidential Permit declaring that the pipeline is in the U.S. national interest because it would cross an international border. The U.S. State Department is tasked with the environmental assessment of the Keystone XL pipeline but the assessment has been plagued with findings of conflict of interest. President Obama is expected to make a decision this year. HOLBROOK, Arizona, January 10, 2014 (ENS) – Petrified Forest National Park has just been expanded by 4,265 acres full of rare dinosaur fossils from the Late Triassic Period, at least 200 million years ago. The addition was purchased by the nonprofit Conservation Fund in January 2013 with a substantial contribution from the nonprofit National Parks Conservation Association. The federal government also participated in the purchase as the National Park Service tapped the federal Land and Water Conservation Fund to acquire the property. Congress annually provides funding for the Land and Water Conservation Fund, a bipartisan program that uses a percentage of proceeds from offshore oil and gas royalties – not taxpayer dollars. LWCF funding for the protection of irreplaceable lands, like the patchwork of publicly-owned and privately-owned properties that make up Petrified Forest National Park, would not be possible without support from the Arizona Congressional Delegation. “This effort is a win-win for Northern Arizona, because when we protect our historic treasures and natural wonders, we also improve the visitor experience and boost our local economies,” said Congresswoman Ann Kirkpatrick, an Arizona Democrat. The newly acquired land, formerly known as the McCauley Ranch, lies east of the historic remains of Puerco Pueblo and connects lands already protected within the park. It preserves the natural views that more than 630,000 visitors each year experience as they drive on the main road through the park, and it secures many fossil-producing sites that are already known to be ideal locations for new paleontological discoveries. Last summer researchers unearthed the two-foot-long skull of a phytosaur, a distant ancestor of the modern crocodile, on the property. They also uncovered a new find for Petrified Forest National Park, a Doswellia, which is a close relative to the phytosaur. 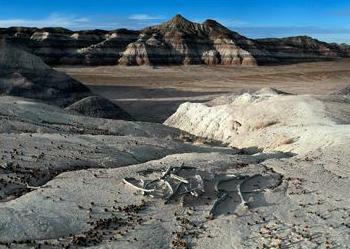 A rich layer of fossil material was identified below the bones that could be the bottom of an ancient pond. Continued excavation will help to determine the pond’s ecosystem and identify the kinds of prehistoric fish, amphibians, reptiles and plants that once lived there. Petrified Forest National Park is famous for its broad vistas of colorful eroding badlands of the Painted Desert, including large trees that have petrified into stone during the last 225 million years. BILLINGS, Montana, January 10, 2014 (ENS) – Motorized vehicle recreation groups are celebrating a Ninth Circuit Court of Appeals decision Tuesday upholding the validity of the Custer National Forest’s Beartooth Ranger District Travel Management Plan. The Plan was released in 2008 to designate routes for motorized access in the Beartooth Ranger District, which includes the Pryor Mountains, in south-central Montana. Despite the Plan’s restrictions on long-existing motorized access, it was challenged in federal court by the Pryors Coalition, a coalition of nonprofit organizations and individuals, including Wildlands CPR and local chapters of the Montana Wilderness Association, Audubon Society and Backcountry Horsemen. The coalition’s lawsuit was dismissed by U.S. District Judge Richard Cebull. The coalition appealed, and their appeal was heard on December 4, 2013 before a three-judge panel of the Ninth Circuit Court of Appeals, which included retired Supreme Court Justice Sandra Day O’Connor sitting by designation. The Ninth Circuit released its decision on January 7, affirming the district court’s ruling and leaving the Travel Plan in place. “This decision validates our patience and hard work on this project defending the sound management of a treasured place on our public lands,” said Bruce Reierson, of the Treasure State ATV Association. “We are still frustrated by some of the closures in this plan, but are encouraged that aggressive preservationists’ efforts to second-guess the Forest Service were not rewarded here by our courts,” added Mona Ehnes of the Montana Trail Vehicle Riders Association. The motorized recreation groups intervening in defense of the Forest Service decision included the Treasure State ATV Association, the Montana Trail Vehicle Riders Association, the Great Falls Trail Bike Riders Association, Families for Outdoor Recreation, Citizens for Balanced Use, and the BlueRibbon Coalition. The Forest Service reduced the miles of motorized routes open to off-road vehicle camping from 150 to 125. It prohibited off-road vehicle camping along 27 miles of non-system routes. In the Beartooth Unit the Forest Service prohibited off-road vehicle camping within 100 feet of the West Fork of Rock Creek or its tributaries and closed over 20 camping sites due to environmental resource concerns, the court pointed out. The court was satisfied that the Forest Service had minimized environmental damage from motorized vehicles by imposing seasonal restrictions on 64 miles of routes, including the sensitive higher elevation routes with which the coalition is most concerned. Click here to see the Ninth Circuit decision. DENVER, Colorado, January 10, 2014 (ENS) – A Colorado big game outfitter and assistant guide are charged with conspiracy for illegal capture and maiming of mountain lions and bobcats in Colorado and Utah. Christopher Loncarich, 55, of Mack, Colorado, and Nicholaus Rodgers, 30, of Medford, Oregon, were charged Tuesday in Colorado Federal Court with conspiracy to violate the Lacey Act, interstate felony transportation and sale of unlawfully taken wildlife, and felony creation of false records concerning wildlife that was sold in interstate commerce. The 17-count indictment was based on the pair’s practice between 2007 and 2010 of illegally capturing and maiming mountain lions and bobcats as part of a scheme to make hunting the cats easier for their clients. Loncarich is a big game outfitter and hunting guide who outfits and guides hunts for mountain lions and bobcats in the Bookcliffs Mountains on the Colorado-Utah border. Hunting seasons for the cats stretch from November to March when snow is likely to be on the ground. Guides release highly-trained dogs on the track of the cats after the guides discover cat tracks in the snow. The hunting dogs follow the cat’s scent, then tree, corner or bay the cat. At that point a hunter arrives and kills the treed cat. The indictment alleges that Loncarich and his assistant guides would trap the cats in cages prior to hunts and release the cats when the client was nearby. Loncarich, Rodgers and other guides would communicate by radio to ensure that they took their clients to the location where the cats had been released. To keep the cats in the areas of potential hunts Loncarich, Rodgers and other guides would sometimes shoot the cats in the paws or legs or attach leghold traps to them. The indictment alleges that many of the clients Loncarich and Rodgers guided did not have proper tags or licenses to take mountain lions or bobcats in Utah. Despite knowing that the clients were hunting in Utah without proper licenses or tags, the pair continued to guide the hunts. Ultimately, Loncarich, Rodgers and other guides are alleged to have brought the animals taken in Utah back to Colorado. Loncarich often took the clients to “check in” the illegally taken mountain lions with the Colorado Division of Wildlife, now called Colorado Parks and Wildlife, where Loncarich would provide false records to obtain seals for the hides. Many of the cats were then transported back to the clients’ home states. To date, four assistant guides have pleaded guilty to offenses arising from the conspiracy. The case was investigated by the U.S. Fish and Wildlife Service Office of Law Enforcement, Colorado Parks and Wildlife, and Utah Division of Wildlife Resources, and is being prosecuted by the Environmental Crimes Section of the Justice Department’s Environment and Natural Resources Division. TALLAHASSEE, Florida, January 10, 2014 (ENS) – Deaths of endangered Florida manatees reached a record high in 2013, more than doubling the previous year’s total, according to state figures. Manatees are classified as an endangered species under both federal and Florida law. Red tides accounted for a third of all the manatee deaths, far more than in any year on record. Preliminary figures from the Florida Fish and Wildlife Conservation Commission, FWC, show that 829 manatees perished in 2013, with December’s deaths not yet fully calculated. This total is more than double last year’s loss of 392 and eclipses the previous record of 766 back in 2010 when a severe cold spell cause mortality to spike. Altogether, the 2013 death toll removes nearly 17 percent of the total manatee population, including 126 calves. Florida red tide, which releases a toxin that affects manatees’ nervous systems, caused the deaths of a record 276 manatees during that period, according to the commission. Marine mammal staff from across the state and law enforcement responded to manatees suffering from the effects of red tide in southwest Florida from January through May, the commission said. 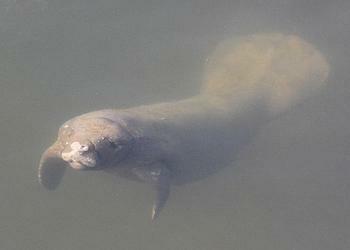 Public Employees for Environmental Responsibility, PEER, an organization of public workers in natural resource agencies, says the high number of manatee deaths last year were the result of lax state enforcement of water pollution standards. Water polluted with excess nutrients can engender toxic red tide events and algal blooms. While algal blooms are a natural and seasonal occurrence, they are worsened by pollution, especially nutrient loading from agricultural and human wastes. PEER says the 276 red tide related manatee deaths in 2013 match the previous eight years combined. They were more than 60 percent above the previous record of 151 red tide manatee deaths in 1996. Coastal water pollution is on the increase in Florida says Florida PEER Director Jerry Phillips, a former water quality enforcement attorney for the state Department of Environmental Protection. More than 115 manatees died this year from an as yet undiagnosed illness in Indian River Lagoon, a major manatee haven. Manatees may not be the only marine wildlife species affected. The disease also appears to be killing dolphins, pelicans and other wildlife in the Atlantic-facing inlet. WASHINGTON, DC, January 10, 2014 (ENS) – The U.S. Environmental Protection Agency will provide design assistance to help the capital cities of Michigan, Wisconsin and Washington develop designs for greener, healthier, more vibrant neighborhoods. Greening America’s Capitals is an EPA program conducted in collaboration with the Department of Housing and Urban Development and the Department of Transportation through the Partnership for Sustainable Communities. The partnership is helping communities across the country create more housing and transportation choices and reinforce existing investments. EPA assistance will help the selected cities pursue green infrastructure, more walkable streets and other amenities. – Lansing, Michigan, which will receive assistance to develop options for transforming a 14-acre parking lot between the State Capitol and Hall of Justice into a public park that showcases green infrastructure and renewable energy technologies. The design assistance aims to help reduce combined sewer overflows, prevent flooding, reduce the heat island effect, beautify public spaces near major civic buildings, and connect pedestrian walkways and transit to community and state institutions. – Madison, Wisconsin will receive assistance to explore ways to make pedestrian and bicycle improvements and add green infrastructure, such as trees and rain gardens, to streets in the Triangle Neighborhood. The project aims to make it easier for residents to access nearby transit, open spaces, and the Monona Bay, and also improve water quality in the bay. – Olympia, Washington will receive assistance to incorporate green infrastructure along Capitol Way to reduce stormwater runoff, improve access to businesses and the waterfront, and adapt to climate change. This is the fourth year of the Greening America’s Capitals program. To date, 15 capital cities have received assistance, including Boston; Charleston, West Virginia; Hartford, Connecticut; Jefferson City, Missouri; Little Rock, Arkansas; Jackson, Mississippi; Lincoln, Nebraska; Montgomery, Alabama; Phoenix, Arizona; Washington, DC; Baton Rouge, Louisiana; Des Moines, Iowa; Frankfort, Kentucky; Helena, Montana; and Indianapolis, Indiana. Click here for more information on Greening America’s Capitals and a link to the reports.